The US Defense Security Cooperation Agency (DSCA) has notified congress of the possible sale of a sixth Boeing C-17 to Australia at an estimated cost of $300 million. The deal would include up to four Pratt & Whitney F117-PW-100 engines, one AN/AAQ-24V(13) Large Aircraft Infrared Countermeasures System, as well as spare parts, testing equipment and personnel training. Australia submitted a formal request in September to purchase the plane through the US Foreign Military Sales system. Congress could reject the deal, though that is extremely unlikely. 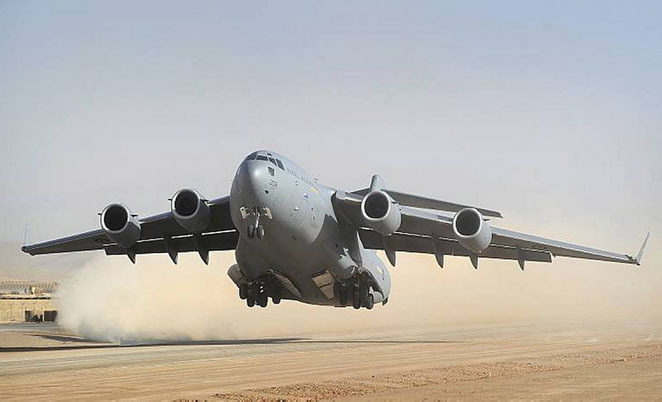 The RAAF’s original fleet of four C-17s, which was announced in February 2006 and delivered from December that year, was bolstered earlier this year by the acquisition of a fifth aircraft, ordered in early April. The fifth C-17 was delivered just 142 days after it was ordered due to an urgent requirement from the RAAF to cover heavy maintenance of its first aircraft, but assuming both the US and Australian governments approve its purchase on schedule, the sixth aircraft isn’t expected to be delivered until the fourth quarter of 2012. In order to accommodate the two new aircraft, the RAAF expects additional ramp and hangar space and terminal facilities will be required at the northern end of Amberley where 36SQN’s C-17s and the growing fleet of KC-30A MRTTs of 33SQN – expected to number four by early next year – are based. Defence Minister Stephen Smith has said the addition of the fifth and sixth C-17 will effectively double the RAAF’s heavy airlift capability when taking into account scheduled and unplanned maintenance. He says the aircraft have proven their worth supporting regional disaster relief missions and the ADF’s deployments in the Middle East.